The name, MORRISON, is most commonly associated with the Scottish clan of either the mainland "son of Morris" (or Maurice) origin, or from the Hebrides. The Wikipedia free encyclopedia - Clan Morrison provides more detail on the various origins of Morrison families. This includes how the Hebrides were settled by both Norse Vikings and Irish (or "Scottish") Gaels, who intermarried with each other and with the indigenous "Picts". The name Morrison of Gaelic origin is said to have been an Anglicised derivation of mac Ghille Mhuire, meaning the "son of the servant of St. Mary". This Anglicisation most likely occurred during the Protestant Reformation and which also included the stamping out of the Gaelic language. Our MORRISON family hails from the Isle of Man and the Manx MORRISON origins appear to be similar to the Scots. The "Mac" in these names refers to "the son of" as in Ireland and Scotland. Also used was "ine" meaning "the daughter of". In the 1511 Manorial Roll of the Isle of Man for the Parish of Balylagh (Ballaugh) there are a number of MacGilborrs mentioned. It is interesting to note that the 1511/1515 manorial roll is virtually 100% mac/ine for Manx names. By the 1703 composition book probably less than 5%. (Frances Coakley, Manx Genealogy Bulletin Board). One of our earliest known ancestors was Patrick Mylvorrey who was born in about 1761 in Ballaugh in the north west of the Isle of Man. The family lived at Glenshoggill near village of Ballaugh as farmers and agricultural labourers. When Patrick married his name was recorded as Morrison his children and were baptised variously as Mylvorrey (or Mylworrey) and Morrison between the 1780s and the 1820s. The next generation generally became known as Morrisons. Patrick's grandson William moved to Santon in the south east of the Isle when he married and it was his grandson William Ernest Morrison who migrated to Australia. 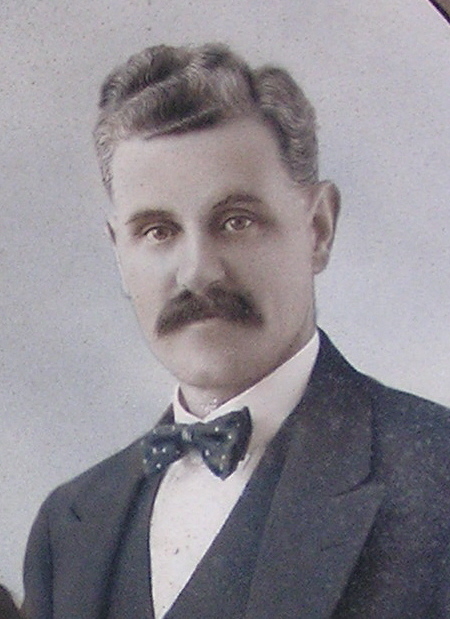 William Ernest MORRISON migrated to Australia about 1910. He was the second of five children to John and Margaret (nee CHRISTIAN) MORRISON. He was born at Ballaquaggan, Malew, Isle of Man on 28 June 1884 and baptised at Santon (St. Sanctain) on 26 October 1884. In the 1901 census his occupation was given as a gardener living at Kentraugh in the parish of Rushen. He migrated to Australia about 1910, possibly on the ship Cornwall out of Liverpool. William married Elizabeth Caroline Marion Thomasina RAMSDEN (nee BRISCOE) in August 1912 and his occupation was given as farmer. The family lived at "Beaconsfield" in Tower Street East Hills on his mother-in-law, Elizabeth BRISCOE's property. Following Elizabeth's death, the property was sold in June 1918 and the family moved to Bankstown. They lived at "The Ranch" in Restwell Street Bankstown and Ernie went into business as fuel and produce merchant with various partners further up the street near South Terrace. In about 1927 after his business failed Ernie left Bankstown, and Caroline struggled in raise her two teenage children, with the help of the extended (Briscoe) family. At the time of his death at Yarra Bay on 20 July 1951, he lived at Riley Street, Sydney. He was cremated at the Eastern Suburbs Crematorium on 23 July 1951. Alfred Ernest MORRISON was the second child of William Ernest MORRISON and Elizabeth Caroline Marion Thomasina RAMSDEN (nee BRISCOE). He was born at home at Tower Street, East Hills, NSW on 2 December 1915. Alfie, as he was known in his younger days, was a good sportsman in athletics, soccer and rugby league. He also played tennis, made easy because of the tennis court in the family property at Restwell Street, Bankstown. On leaving school after sixth class he finally became an apprentice and then master carpenter. A defining part of Alf's life was his military service in World War II. He enlisted at Victoria Barracks in Sydney on 11 June 1940. After training at Liverpool and Bathurst he sailed as part of the 8th Division, 2/12 Fld. Coy., R.A.E.to Singapore on the Dutch liner "Johan van Olderbarnevelt". Japan entered the war on 7 December 1941 and by 15 February 1942 Singapore had fallen and he became a Prisoner of War (POW) until the end of hostilities on 2 September 1945. During the more than three and half years of captivity Alf was interned at Changi gaol on Singapore Island and was part of "F" Force labouring on the notorious Burma Railway. Alf finally arrived home on the Largs Bay in October 1945 and was discharged on 8 January 1946. After the War Alf married Norma Beryl BRAY, who was also brought up in Restwell Street, Bankstown, on 13 July 1946. Alf and Norma raised a family of four children at Yagoona, Narooma and then Sutherland before moving to Sawtell on the NSW North Coast where they retired. They spent their final years in the Masonic Village at Lakehaven on the Central Coast. Like most of the POWs Alf's health was adversely affected by his experiences but he lived to enjoy his retirement as a Totally and Permanently Incapacitated pensioner until shortly before his eightieth birthday in 1995. The family CREER, which is a unique Manx name, has a connection to our Manx Morrisons by virtue of Ann Jane (or Annie) MORRISON from Glenshoggle in Ballaugh who migrated to Western Australia in 1909 to marry John CREER. John had himself come from the Isle of Man in 1905 and arranged for Annie to follow him and marry. The Creer family still lives in Western Australia today and we share a common ancestor in Patrick MYLVORREY, born 1793 in Ballaugh, Isle of Man. For more details see the CREER FAMILY HISTORY website.